So compact and portable, you can bring it and use it anywhere! 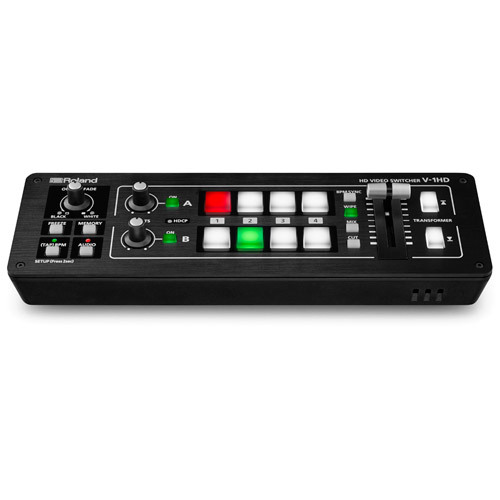 Easy-to-use mixer offers 4-channel HD video switching, built-in compositing effects, multichannel audio mixing and more. 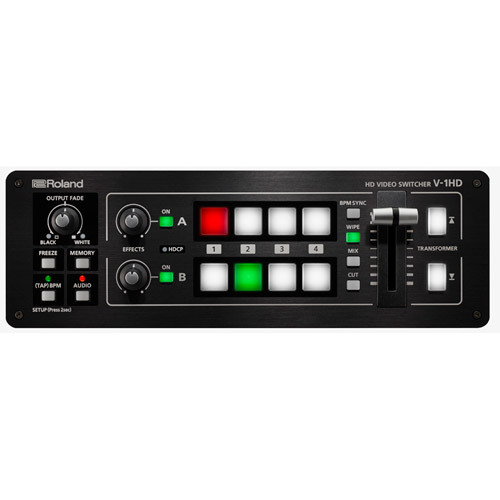 Roland's new HD Video Switcher makes it easy to connect and switch video cameras, smart phones, computers, tablets, Blu-ray players and other HDMI video sources with a simple push of a button or slide of the T-Fader. The V-1HD supports professional compositing effects such as picture-in-picture and keying allowing for graphic insets, titling or even “green screen” ideal for news broadcast or corporate training productions. For creative live event video switching, the V-1HD includes an advanced video effects for transforming video into creative visuals to support all kinds of performances. Output of your video mix is as simple as connecting the HDMI output to a projector or screen at an event and you can even connect a recorder for capturing your event or production. As well as small broadcast setups for enterprise video users, K-12 schools and house-of-worship environments. It is also an amazing creative tool for visual artists or musicians, who want to add video switching to their performances, create YouTube videos, mix content for online streaming and more. 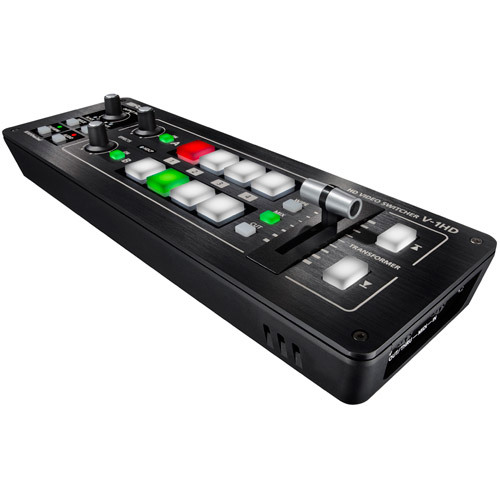 It is the most affordable 4-channel HD video switcher that includes a hardware interface, video FX and audio mixing/FX, making it a complete portable video switching and control solution. The companion PC/Mac or iPad application when connected by USB can also control the V-1HD. Including cameras, computers, tablets, smartphones and even Blu-ray players, thanks to its HDCP copy protection support. Its high definition output can be switched between 720p (from 720p inputs), 1080i or 1080p. In either 1080i or 1080p output mode, the V-1HD can accept both 1080p and 1080i input signals simultaneously, allowing use with a range of sources. 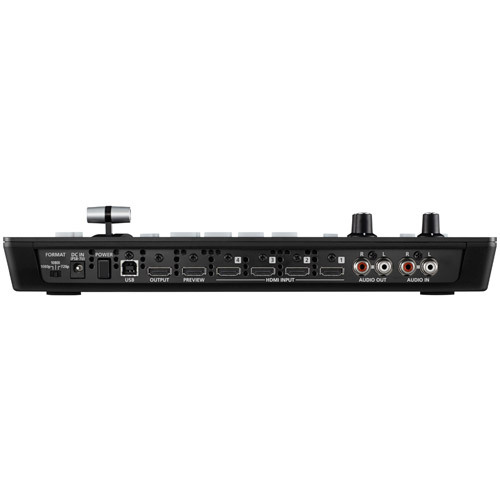 It has a 12-channel audio mixer for mixing stereo audio from HDMI and external stereo audio sources and its dedicated microphone input. The V-1HD includes two HDMI program and preview outputs and a stereo audio output. Including picture-in-picture and keying, allowing for graphic insets plus titling and green screen capabilities. The V-1HD is ideal for live event video switching, thanks to its advanced transition and filter effects – more than 30 effects and transition types including mix, cut, full additive mix (FAM), non-additive mix (NAM), wipe and other performance effects. 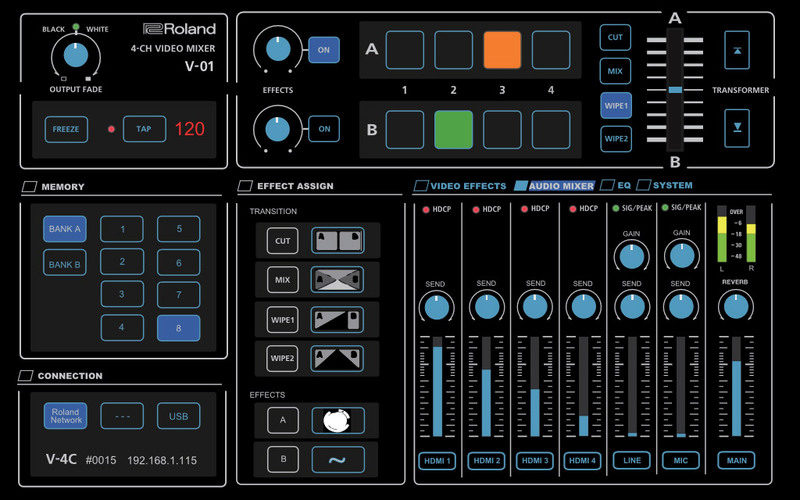 The V-1HD also has output fade, BPM Sync and Auto-Scan functions. The A and B video busses each have controls for effects assignment and parameter control. The output can be switched A/B or in PGM/PST mode where the B buss is used for signal preview. 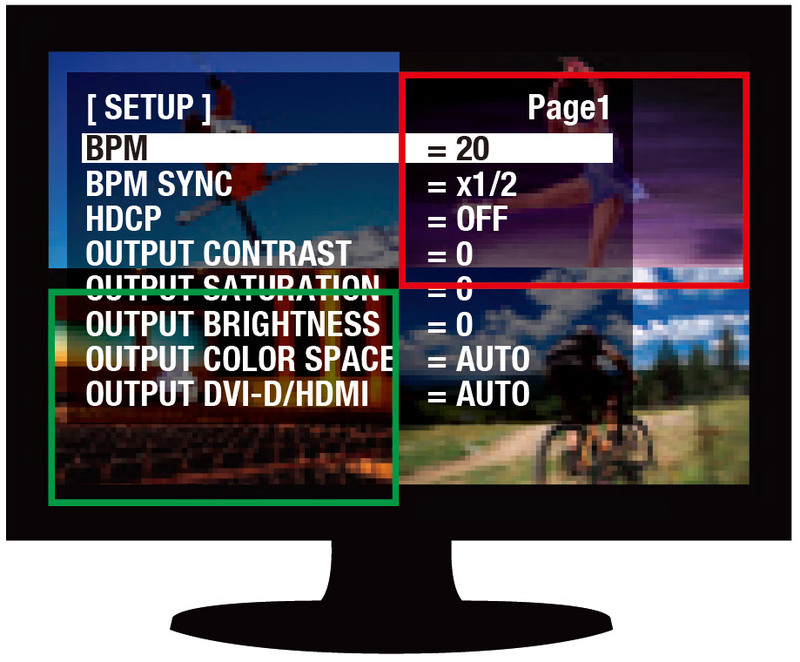 The preview output can be set to a Multiview mode, where all inputs are displayed with colored borders indicating the program and preview selections, or in a full-screen mode. The preview output can be used for additional, menu-driven set-up control, or as a second output for applications such as a simultaneous webcast or recording output. Included is a 12ch digital audio mixer. In addition to 4 stereo audio inputs from the HDMI ports, the V-1HD also supports a stereo line level input and a mic level input. Every channel is equipped with a delay function to synchronize the video and the audio. * maximum delay time is 500ms. Audio follow function enables the audio transition along with the video. Reverb function and mastering function used for adjusting sound quality and volume are also supported. 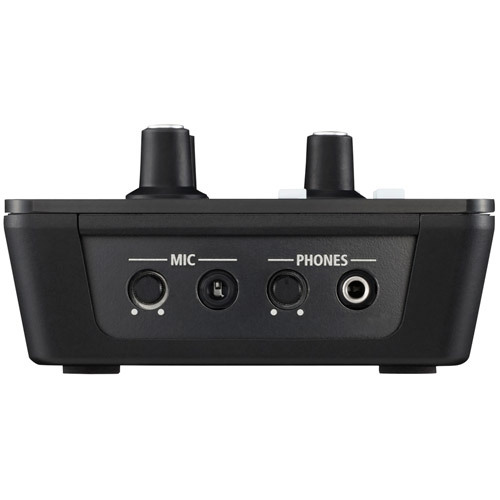 With audio output jacks you can send the audio mix to a PA system or record it on an external device. 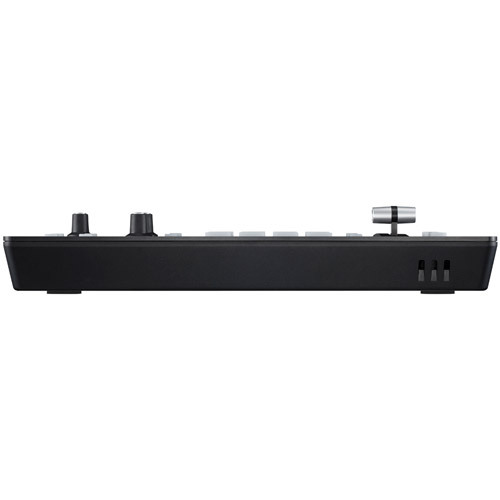 Basic operations can be done by operating the buttons and the T-Fader on the unit. To make detailed settings you just need to connect a monitor to the preview connector. Four-way multi-view preview screen shows every input source (non-drop frame). A red border shows the video currently being output and a green one indicates the video to be output next. There are three types of view modes available for the preview output which are Multi-view, Output (as a program output) and Preview. On-screen display can be turned on or off. Remote control is possible with the dedicated application on a PC or an iPad connected via a USB cable. The user interface is very easy-to-see and you can make detailed settings through it.You can use the unit to switch video and mix audio on the application. 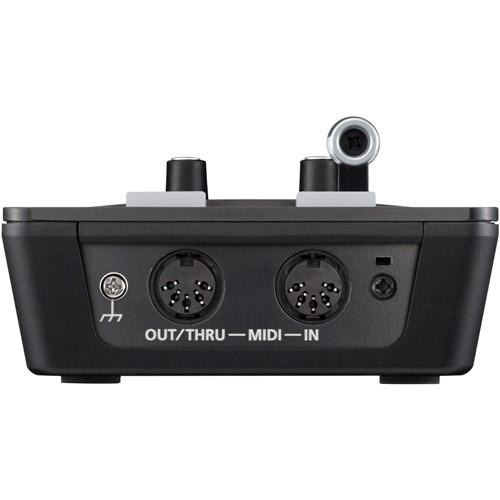 You can control the unit from a music instrument or a sequencer via the MIDI input connector. 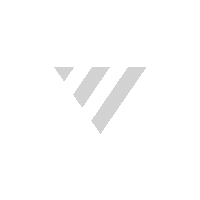 Support for video cameras, action cameras, smart phones, tablet computers and other HDMI devices. The switching and mixing can be done with local buttons. On-screen display will satisfy the need for detailed settings. Connect to a PC or a tablet computer for even more control. Two full HD outputs support preview, projection, recording and webcast etc.